Baghdad College And America's Shifting Role In Iraq First opened in the 1930s by New England Jesuits, Baghdad College became the Iraqi capital's premier high school. It also symbolizes an era when the United States was known in the Middle East not for military action, but for culture and education, says journalist Anthony Shadid. 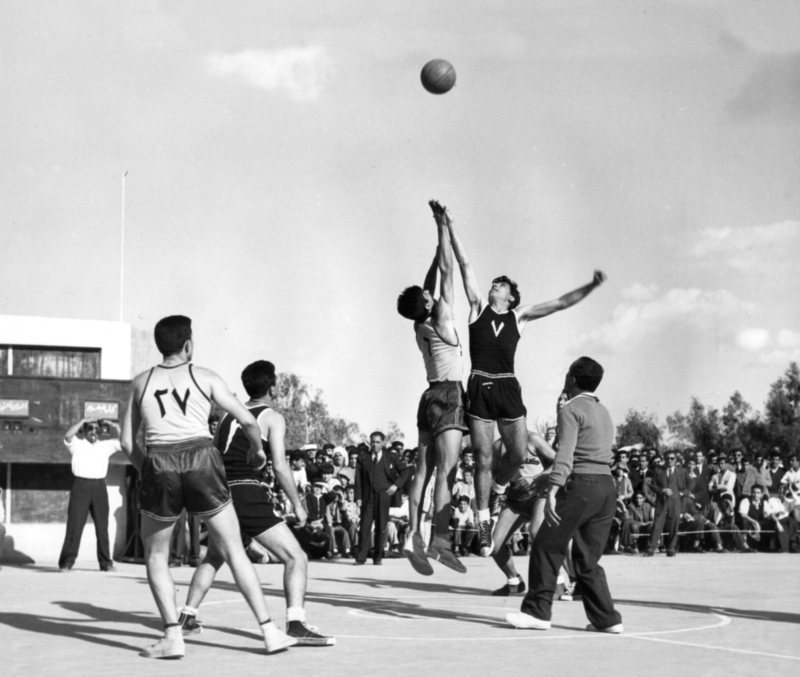 Students play a basketball game on the campus of Iraq's Baghdad College, in this undated photograph. A school founded by Americans in Iraq before the Saddam Hussein era is an emblem of a time when the United States was known in the Middle East not for military action, but for culture and education. That's the view of Puliter Prize-winning New York Times correspondent Anthony Shadid, who recently wrote an essay about the school, titled "The American Age, Iraq." First opened in the 1930s by New England Jesuits, Baghdad College became the Iraqi capital's premier high school. Classes were conducted in English — and the defining feature of the school was not proselytizing, but a rigorous education, Shadid says. As Shadid tells Morning Edition co-host Steve Inskeep, the school was a symbol of Iraq's identity — which he says was more secular and universal in the middle of the 20th century than it is today. The school "also represented something for both the United States and for Iraq, and the way that they saw each other," Shadid says, "that they could allow themselves an almost idealistic version of each other. I think that's impossible today, and I say that with a certain sense of sadness." One reason for that change came in the late 1960s, Shadid says, when Saddam's Baath Party assumed power — and also placed all of Iraq's schools under state control. But international views of America have also changed since those days, he says, noting that the Jesuits ran their school in an era when many people held "a much gentler notion" of Americans' role in the world. In conducting research for the article, Shadid says, he asked people "where they would mark the end of that kind of era, when that sense of American benevolence gave way to what a lot of people would see as American imperialism." "Some people put it at the founding of Israel in 1948; some people put it in the Egyptian revolution in 1952," he says. "My own sense in reporting this story was that it was maybe even a little later, with Vietnam, with the change in government in Iraq. But it is clear that that image changed — and I think it changed unalterably, in some ways." Shadid's essay "The American Age, Iraq" is in the latest issue of Granta, in which the British journal collects stories related to the 10th anniversary of the Sept. 11, 2001, attacks.